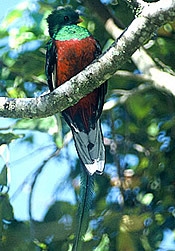 The resplendent quetzal is found in the forests of Central America from southern Mexico to western Panama. Adults grow to be 14 inches long and weigh about 7 ounces. The most striking feature of this bird is the tail of males which has emerald green feathers and can grow up to 3 feet long. The rest of its plumage is very colorful, varying from greenish-gold to blue-violet, with the exception of the breast which is red for males and more muted-red or grayish for females. Males also have a helmet-like crest with golden green feathers. Females are less striking in appearance than males, with more brown colorations than green. The resplendent quetzal is found in the canopy and sub-canopy of undisturbed humid montane cloud forest, thickly vegetated ravines and cliffs, and pastures at forest edges. In Costa Rica, they are known to migrate to higher altitudes when they are ready to breed, later returning to lower elevations in the non-breeding season. Breeding season may last from February to July. The males attract females by performing courtship dances, aerial displays, calls and loud singing. Nests are built by carving holes in rotten trees. Females give birth to one to two eggs, and the eggs are incubated for 17 to 18 days. Both parents help with keeping the eggs warm and also feed the chicks after hatching, although the female is known to neglect or even abandon the chicks later on, leaving it up to the male to continue caring for them until they are ready to survive on their own. The survival rate of the chicks is low due to predation by other animals such as brown jays and squirrels. This species prefers to feed on fruit, but when fruit is unavailable they can eat insects, such as larvae, wasps, and ants, and also small frogs. They are solitary creatures except during breeding season. 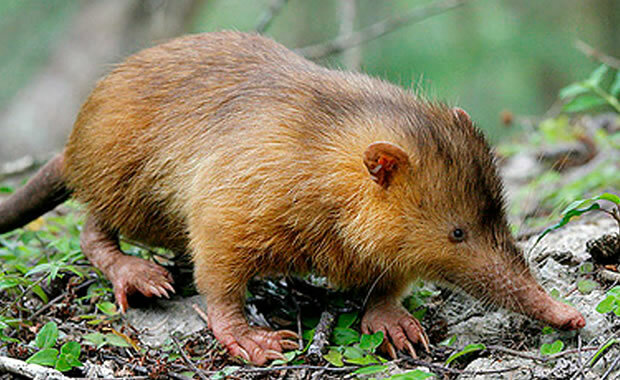 This species is threatened by loss of habitat due to agricultural development, and they are also hunted for food and trade. It is legally protected in Mexico, Guatemala, Costa Rica, and Panama, but poaching still occurs in remote areas where enforcement of the law is difficult. Some birds are protected in national parks of Costa Rica, and there are several other reserves that exist to preserve the species. Copyright Notice: This article is licensed under the GNU Free Documentation License. It uses material from the Wikipedia article "Resplendent quetzal". Glenn, C. R. 2006. "Earth's Endangered Creatures - Resplendent Quetzal Facts" (Online). Accessed 4/23/2019 at http://earthsendangered.com/profile.asp?sp=386&ID=9. Need more Resplendent Quetzal facts?